This no-knead 5-minute artisan bread explains how to make homemade bread in just minutes a day without fuss. Quick, easy, rustic, and the best bread you’ll ever bake ever, including after you come home from work. This no-knead 5-minute artisan bread is truly “revolutionary.” That’s the word the authors who created this quick homemade bread recipe use to describe it, and we couldn’t agree more. Like so many rustic bread recipes, it relies on just pantry staples of all-purpose flour, yeast, salt, and water. But what distinguishes this recipe, its true genius, is the technique. There’s no kneading required. More than that, though, you can stash it in the fridge for later. So you simply forget about it until you’re overtaken by the craving for freshly baked bread. When that happens, you just grab the dough from the fridge, lop off enough for a loaf, shape it, let it rest a few moments, and then slide it in the oven before you continue to go about your life. We’re talking 5 minutes of effort here. Seriously. Just don’t come forget to come back later to retrieve the best loaf of artisan bread you’ve ever experienced from the oven. The authors created this recipe so that it can accommodate any shape loaf, whether the round boule you see in the photo above, a baguette, bâtard, ciabatta, couronne, crusty white sandwich loaf, Pullman sandwich loaf, or soft dinner rolls. The recipe below instructs you on how to make the French boule (pronounced “bool” and meaning “ball”). But if you’re experienced in shaping the others, or want to Google instructions on the others, by all means, go right ahead. The dough will work admirably. 1. Warm the 3 cups water just a little so that it feels just slightly warmer than body temperature. That should put it at about 100°F (40°C). In the large bowl of a standing mixer or a 6-quart container with a lid, mix the yeast, warm water, and salt. Don’t worry about getting the yeast to dissolve. Add the flour all at once, then use a spoon or stand mixer to mix until the flour is completely incorporated and you have a blobby dough. (If you’re hand-mixing the dough and it becomes too difficult to incorporate all the flour with the spoon, just use very wet hands to press the mixture together.) Don’t knead the dough! It’s not necessary. You just want the dough to be uniformly wet and loose enough to conform to the shape of its container. All you need to do is be certain that there are no dry patches of flour. 3. After 2 hours, stash the container of dough in the fridge. That’s it. (If your container isn’t vented, you want to ensure the gases can escape by leaving the cover open a crack for the first couple days in the fridge; after that, you can seal it.) You can use the dough anytime after the initial 2-hour rise, although the refrigerated wet dough is less sticky and easier to work with than dough at room temperature, so it’s best to refrigerate the dough overnight before handling it. Once refrigerated, the dough will seem to have shrunk back upon itself as though it will never rise again—that’s normal. Whatever you do, do not punch down this dough. You’re trying to retain as much gas in the dough as possible, and punching it down knocks gas out and results in denser loaves. Just be certain to use the dough at some point within 14 days. 4. When you want to bake a loaf of artisan bread, dust a pizza peel or a baking sheet turned upside down with cornmeal or line it with parchment paper. Grab a hunk of the dough and use a serrated knife or scissors to cut off a 1-pound piece of dough. Hold the dough in your hands and, if necessary, add just enough flour so the dough doesn’t stick to your hands. (What you’re trying to do is surround the surface of the dough with flour so that it can be handled. You are not trying to incorporate more flour into the dough, so for the love of all things good, resist the temptation to get rid of all the dough’s inherent and lovely stickiness by working the flour into the dough.) Gently stretch the surface of the dough, tucking the ends underneath the ball and rotating it a quarter turn as you go. Most of the dusting flour will fall off, and that’s okay, because as we just said, it’s not intended to be incorporated into the dough. The bottom of the ball of dough may appear to be a collection of bunched ends, but it will flatten out and adhere during resting and baking. Your round loaf of bread should be smooth and cohesive, and the entire shaping process should take no more than 20 to 40 seconds—don’t work the dough any longer or your loaves may be dense. Place the shaped ball of dough on the prepared pizza peel and let it rest for about 40 minutes. It doesn’t need to be covered. You may not see much rise during this period, but don’t fret. It will rise much more during baking. 6. Dust the top of the raised loaf generously with flour and, using a serrated bread knife, slash a 1/2-inch-deep cross or tic-tac-toe pattern in the top. There’s no need to dust the flour off the loaf. 7. Place the far edge of the peel or the upside-down baking sheet in the oven on the baking stone a few inches beyond where you want the bread to land. Give the peel or baking sheet a couple quick back-and-forth jiggles and then abruptly pull it out from under the loaf. The loaf should land on the baking stone with very little drama. Quickly but carefully pour about 1 cup hot water into the broiler tray and immediately shut the oven door to trap the steam. 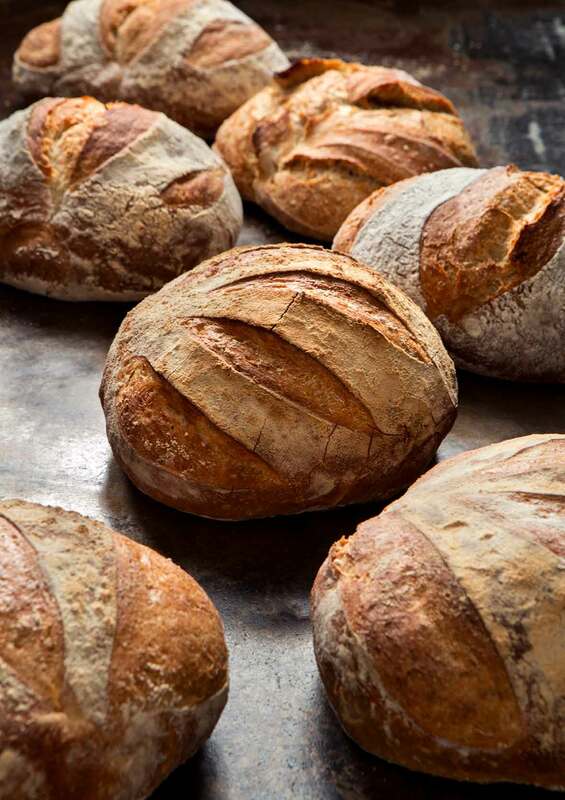 Bake the bread for a total of 20 to 35 minutes, until the crust is richly browned and firm to the touch. (Don’t worry. Because the dough is so wet, there’s very little risk of it becoming dry despite how dark the crust may become.) And crazily enough, a perfectly baked loaf will audibly crackle, or “sing,” when initially exposed to room temperature. Let the loaf cool completely, preferably on a wire rack for the best flavor, texture, and slicing. The crust may initially soften but will firm when cooled. 5-Minute Artisan Bread Recipe © 2013 Jeff Hertzberg and Zoë François. Photos © 2013 Stephen Scott Gross. All rights reserved. All recipes and photos used with permission of the publisher. I’ve made six or seven dozen loaves of 5-minute artisan bread. That's no exaggeration. (That's one of my babies below.) When I don’t want to think too hard, which these days is often, I whip out Zoë’s and Jeff’s book, flip it open to the master recipe, and start measuring. (I always use a scale, and every loaf has been perfect.) The One, who’s not a bread fan (it was always foisted upon him as a kid so he would fill up), devours these. In fact, he even pleads with me not to make them because he can’t stop eating them. What I love best about the recipe, though, is it’s so versatile. To whit, I have made loaves with bacon, Parmigiano-Reggiano, and black pepper; sausage and Cheddar cheese; rosemary and olive oil; sautéed onion; chopped black olives. You name it. And I’ve made all kinds of shapes: boules, loaves, pan loaves, couronnes, epi. It’s the official bread of our annual cassoulet party, and guests even place an order for a loaf to take home. Trust Fatty Daddy, you’ll never go wrong with this recipe. Wow! What a gorgeous, beautifully colored, irresistible loaf of artisan bread! I wish I'd made more loaves at the same time. The loaf had a chewy crust and a beautiful interior. Forming the boule and transferring it to my hot pizza stone were simple enough. I made a tic-tac-toe pattern on the top of the loaf, and there was definitely a significant amount of flour on the loaf, but it didn't burn. My loaf baked for 25 to 30 minutes. We love the aroma of bread baking in the oven, and we were all watching and waiting for the loaf to cool so it could be sliced. This was truly Artisan Bread in Five Minutes a Day, and I can't wait to try some other variations on this. I nearly always have some of this dough in the fridge. This 5-minute artisan bread is a simple 4-ingredient dough. I used a wooden spoon in a large mixing bowl and finished with my wet hands. The dough was very lumpy and sticky. After the 2-hour rise, the dough was full of holes, which are very noticeable throughout when using a glass bowl. After refrigerating the dough overnight, it was very easy to work with. So easy, in fact, I really didn't need to flour the surface before cutting a loaf-size amount from the dough. I made a couple of boules, and while they had a nice crumb, the crust was spectacular! This dough is perfect to have on hand for any occasion. If, like me, you love a crisp, crunchy bread, this recipe is for you. If you leave the dough in the fridge for at least 48 hours, the crumb has many more holes. When you use it the next day, the crumb is much tighter. I prefer mine with holes to capture all of the goodies that I apply. This has to be the easiest and fastest way to make bread dough. It's also now my favorite way to make bread dough—and a decent loaf or boule of bread with little effort. I made a free-form boule and a loaf in a traditional loaf pan. I found that after baking the loaves for 30 minutes, I had a tanned boule, much like a round sourdough loaf. I found this loaf had a moist and dense crumb and a crunchy crust. As for the loaf pan, I found that batch didn't rise as much, but this may be due to my handling of the dough. It was still delicious. This is certainly a way to wow on a weeknight, as the bread does its own thing while you prep dinner. A great method for making bread. I used a 10-quart storage container with a lid. While the dough was rising, I left 1 corner open, and then when I refrigerated it, I closed that corner. It really is a good idea to open it the first few days to allow the extra gases out. I find it's a good workout mixing the dough with a wooden spoon (about 6 or 7 minutes of mixing), but I've used a stand mixer in the past with other bread doughs for speed (about 3 or 4 minutes). Both work equally well. The resulting dough looks like wet pizza dough, sort of jelly- or pudding-like. When the work is done, all that remains is to use it within 14 days. I so far have not had this dough last a week. The only suggestion I would make is that you should check your yeast to make sure it's still viable before mixing your dough. I forgot to do that, and my first batch failed to rise. I replaced my yeast with fresh, and the second batch performed as it should. 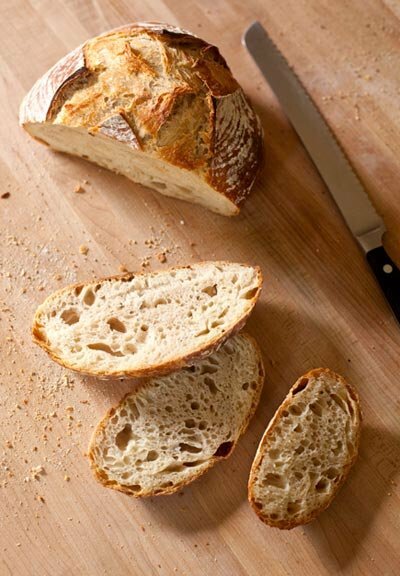 This 5-minute artisan bread is absolutely delicious! I love the warm, earthy flavors, the spongy, chewy texture, and the crisp crust. Great recipe. I just used the last of the dough that was in the refrigerator. However, I don't have a pizza peel, so I used a small bread board with a handle. When I tried to put the dough on the baking stone as instructed, it fell and lost its shape, and I had to pick it up and re-shape it. I took the bread out of the oven when it was 210°F, and the top was richly browned. It took only about 20 minutes to bake the bread. This recipe was well worth the time. I'm going to start off by saying that this 5-minute artisan bread dough is gorgeous and comes together without a hitch. I followed the directions precisely and used exactly 6 cups flour. It's a lovely, sticky dough that's a bit difficult to work with unless you're used to working with loose doughs. After allowing the dough to rest in the fridge for 2 days, I embarked on making the boule. I followed the directions precisely, and even without a pizza peel, I was able to put the formed boule onto the preheated baking stone without changing the shape too much. Don't be scared to use a lot of flour to help you shape the dough—it won't get incorporated at all, and it looks rather gorgeous against the burnished crust. I baked the bread for exactly 30 minutes and then placed it on a rack to cool. The resulting boule was golden brown, with a lovely crust, fantastic chew, and wonderful flavor. I have used this so often, I have used about 10 bags of flour making this bread. The taste is amazing! I prefer the baguette. Amazon sells the baguette pan. Very easy to make and almost addictive. Rita, I’m right with you on this. Pounds and pounds of flour have gone into these breads. Susie, good morning! We suspect perhaps the yeast is old or otherwise defunct. But I’m reaching out to the creator of the recipe to see if she has any other troubleshooting advice. Please stand by! There are three reasons why the dough wouldn’t rise in two hours. 1. The yeast is no good. This doesn’t happen often, but it has happened to me on a few occasions over the decades. Check the expiration date and make sure it is current. If you don’t use your yeast very often you can store it in the freezer to extend the life for a long time, even beyond the stamped expiration date. If you happen to buy yeast in bulk from a co-op it is hard to know exactly what the expiration date it, so I avoid doing so. If you want to buy a large amount, you can find 1-pound blocks at Costco for about $5.00, a great deal. 2. The yeast may have just needed more time to activate. If your water was cool or cold, it can take up to 12 hours for the yeast to come to life. There is no harm in leaving the dough at room temperature for that period of time, until the dough rises. 3. Is there a chance you forgot to add the yeast to the dough? I’ve done it on several occasions, so you’d be in good company. If so, you can still add it. Make a thick slurry with the yeast and a tablespoon water and then mix the dough with a dough hook in a stand mixer. It is really tough to do this by hand, so I highly recommend a heavy duty mixer. Amazing recipe! A million thanks!!!! I have bread flour, can I substitute some of that for AP flour? sumara, the authors are clear about when you can use bread flour–usually when the loaf needs to hold a particular shape. For this loaf, I think you’ll have better success if you use AP flour. Hi Sumara, you can use your bread flour, but you’ll want to add 2 to 4 tablespoons of additional water to compensate for the additional protein in the bread flour. I recommend making the recipe with all-purpose once so you know what the consistency is supposed to feel like, then you can experiment with other flours. Here is some more information about using different types of flour. All of the recipes in this book are fantastic. If you end up with just a bit of dough leftover, make little balls and deep fry them…then toss with butter and garlic. SO good and they don’t get soggy either. Carla, I love this idea. I sometimes have leftover dough, so I’ll give this a whirl. 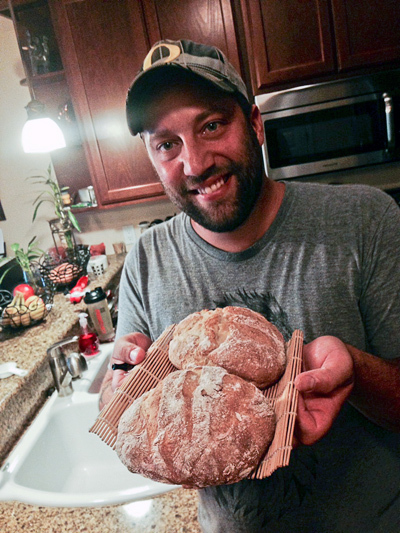 I have been making Zoe and Jeff’s breads since their first book came out and the breads that I’m able to produce are amazing. stuofnankinchowmien, I can’t agree with you more. Great bread. This is the third Artisan Bread in 5 books I have and I love them. Bread for the lazy? No…. just super simple and perfect every loaf! And really the best Challah ever. The book, the authors, and the recipes are amazing, are they not, Jamie?! Thank you Renee, you’re so sweet! I’m so thrilled you’re baking from the book! Thank you so much Jamie, you’ve made my day! While my youngest was still in school, I would have two loaves waiting fresh out of the oven when she got off the bus. She would stand by the kitchen island and eat half a loaf before she said hello! I still feel good every time I think about those days. Grown up and out of the house now. Zoe, you gave me and mine some great memories. Thank you! Hi Rita, it is funny to think mine was sitting in a bouncy seat on the counter when I wrote that book and now he’s taller than me. ;) So pleased you enjoy the bread with your family! My best childhood friend turned me onto this recipe; I turned my neighbor on to it; and we three make it all the time. I usually bake it in the oven on a half sheet pan with a roasting pan turned upside down over it to avoid using the water to create steam and find it works well. I have also baked it in a cast-iron Dutch oven with great success. I even baked a little ficelle in a Le Creuset cast iron terrine, but I would really need two terrines to do that regularly. I have recently found a baking “steel,” instead of a stone on which to bake bread and pizza, and if it works well, I will give you a heads up. It’s a great idea – should conduct heat superbly and will not break. I have the original Artisan Bread book and recently got the revised Kindle edition (1) so I have it with me all the time (you never know where you will be when the mood to bake a loaf of bread and show off strikes) and (2) I have a lonely Pullman Pan in my cupboard begging to be used for the first time. I consider this recipe to be a miracle. Thank you, Victoria. How wonderful that you and your friends all bake together. I am so curious what you think of the steel. I’ve yet to try it, but it seems like a great product. Do let me know what you think. I’ve done two batches of this recipe on the Baking Steel and it worked perfectly! The first batch was your recipe exactly. The second I subbed half of AP flour for whole wheat and it was wonderful! The steel is a lovely tool for a beautiful crust. Thanks for this recipe! I was reading the comments hoping for someone who used a Dutch oven. Time? Temperature? Thanks! Nancy, this doesn’t use a Dutch oven. You might want to check out Jim Lahey’s recipe, which dies. I use a similar recipe, but it has a higher water content, so it doesn’t need steam to make a crackly-crisp crust. This recipe is definitely going on my to-do list though! Hey, Lola, wanna share your recipe? Has anybody tried baking bread (specifically this bread as it is so easy and tasty) in a Roemer Topf? Would I still need that broiler pan of water after soaking the Topf in water overnight? Cover or not to cover, that is the question…… I’m going to try it anyway but it would be great if somebody could share what experience they have. Most people don’t have a clue what wonderful foods can be cooked in the RT, talk about the original one pot meal! Haven’t done any baking in it but would like to try. Thanks. I haven’t, but I think the authors have. I’m sure they’ll check in. Hi Hunddee, Here is a post on baking in a clay cloche. It isn’t a Roemer Tpf, but the technique will be the same. It makes wonderful crust! 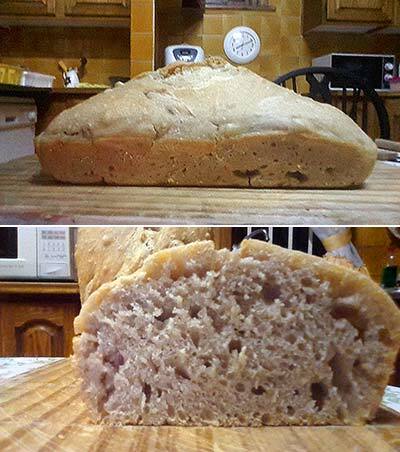 I tried this bread recipe twice, although is is an easy recipe, I found it didn’t rise enough and it was very yeasty tasting. Threw it out. Hi Deborah, Some people are more sensitive to the taste of yeast than others, so you can always decrease the amount of yeast in the recipe, but you’ll need to let it rest a bit longer. Here is some more information. If your dough doesn’t seem to rise enough for your liking, you can always let it rest longer, and it will have a more open crumb. Here is more information. Deborah; You probably had a problem with your technique or your ingredients. The recipe is perfect and works. Sorry you did not have a good outcome. Wow, wow, wow. Best ever!!! Really 5 minutes tops to start the dough. Made 2 generous loaves, 1 regular, the second I stuck full of garlic cloves. In my book Zoe and Jeff get a Nobel prize for bread making. Next time will try with chopped dill, maybe fried onions. Can’t believe the quality and taste of the final product. Dipped it in chimichuri HEAVENLY!!! Can see myself using Costco bags of flour!!! I hear you! I’m now buying flour in 50-pound bags thanks to Zöe and Jeff. What things can I add to the bread besides dill and garlic? Mix dry ingredients together, then add water and mix til combined. Dough will be a goopy shaggy mess. Cover with plastic wrap and let rise in a draft free place for 12-20 hours. 2 hours before you want to bake, wet hands and turn dough out onto floured piece of parchment paper. Bring the edges of the dough together and turn over, and transfer the dough ball on top of the lightly floured parchment paper into another bowl. Cover with a cloth and let rest for those 2 hours. Half an hour before baking, set oven at 450F and place the baking pan or appropriate pot (think Le Creuset. Should be able to withstand very high temp) in the oven to preheat. After the dough has risen to your liking, take the pan/pot out of the oven and lift the parchment paper containing the dough right into your vessel (hassle-free transfer!). Place the lid and put back in the oven. Bake for 30 minutes, then take the lid off and bake for another 15-20 minutes or until bread is golden brown and makes a hollow sound when tapped. Enjoy hearing that crust crackle! Thanks, Lola! That’s Jim Lahey’s no-knead bread recipe, I believe. I use these ingredients and measurements to make my baguettes. The only difference is that I use roughly 1 cup of water. I mix everything together and let rest in a bowl for 1 hour. Then I fold the dough over several times. No kneading, just fold over. Let rest another hour and repeat the folding. Then I refrigerate overnight in a greased, covered bowl. The next day, I divide it into 3rds, fold each one once, shape into a log and gently roll them with my hands, until they are roughly 13 inches long. Then I place them in a baguette pan with the lid and let rise 90 minutes. Slash the tops several times, spray a little water on the tops, cover and bake in a preheated oven at 450° F for 20 minutes and then uncover for 5-10 minutes or until the loaves are browned. My kids thought I bought the bread or brought it home from an Italian restaurant. I now make this weekly. It was my very first homemade bread that actually turned out! This is truly revolutionary — I can’t wait to give it a try! Love, love, LOVE this bread. It’s one of those recipes where I can’t decide if I should tell everyone I know about it, or selfishly keep it as my own little secret and just impress everyone who doesn’t make their own bread. It is simple, rustic and the crust comes out to crispy perfection every time! Thanks for another “keeper”. Karen, I, too, have the same reaction: tell the world or keep it to myself. I finally told. I can’t keep a secret. Nor can I……..consider this shared……with many. karin, you certainly can! Simply add them when you mix the dough in the initial stage. Can I substitute the a portion of the flour for wholemeal, rye or spey flour? will it work if I knead in some roasted sunflower seeds before shaping? thanks and hugs from Germany! Hi Mica, we didn’t test it that way but gosh it sounds great! Please give it a try and let us what you used and how it turned out. Hi, does this recipe work with rye or whole-wheat flour?? Hi Basak, the author of the recipe recommends that you follow the Master Recipe as written until you get a feel for the proper consistency. This is because the hydration needed for bread storage will vary from flour to flour due to the gluten content. The higher the gluten, the more water that will be needed. Once you get a feel for the dough, then experiment with other flours. basak, it definitely can work with other flours, but the amounts are different. I suggest purchasing the book. You won’t be disappointed. The bread that I make from ABI5MAD is caraway rye. It is the bread that got these two “baking fools” together in the first place. 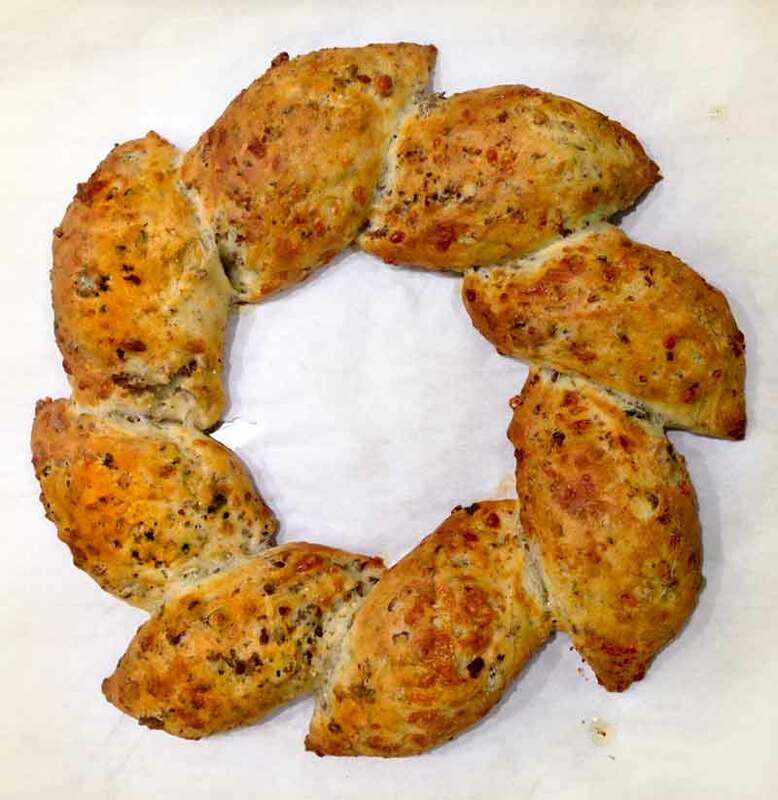 I add caraway seed to the recipe in a greater amount and I add 1/4 cup of dry onion flakes to the dough. You need to make a couple to get the feel for the dough and how to handle it. Like everything in baking, technique is important and you have to work on the product to get it perfect. My daughter likes the larger bread for sandwiches and I make many appetizer size loaves for holidays where I need smaller slices for chopped liver or chopped herring salad. stu, it sounds great! I love the idea of the onion flakes. Chris, this a photo from the inside of a loaf similar to the loaves above. (This is from the authors.) They have also sent along a very useful link for anyone having dense crumb issues, which sometimes happens to me. Hi Patrick, I have never done this with The Zoe Francois bread but, I am certain that the flavor may be enhanced with a bit of “old dough” It certainly couldn’t hurt. This dough already rests in your refrigerator so old dough wouldn’t be necessary but it could be a matter of personal taste. This bread has a fine taste as written and I’m guessing you will be pleased. Made this for the first time last night added fresh rosemary and roasted garlic. Simply put amazing recipe, very easy and delicious. Thank you very much this will recipe is one that will stay for good. Gustavo, you bet. I love this recipe. And if you send me your photos at david@leitesculinaria.com, I’ll add them to your comment. We are making more tonight roasted jalapeño & aged white cheddar, asiago & smoked chicken, cranberry, walnut & goat cheese!!!! Thank u so mucho!!! Gustavo, I love this photo for many reasons. 1.) The breads look incredible. 2.) I think it’s the first photo that shows a reader in it. and 3.) You look so freaking happy and proud!! I love the variations you’re dreaming up. Send more photos, please. Aloha from Maui. I have experimented with this bread. I also get excellent taste and results skipping the last step! I add garlic and rosemary to the recipe and only use bread flour. I put it in a silicone form, fill it about half way, and let it rise for 2 or 3 hours. When you see it has doubled put your oven on at 450. Maybe not as pretty, but really good!!!! Aloha, Nader. I think your comment shows just how amazingly flexible this recipe is. It’s almost, almost fail-proof! Wow, can’t wait too try this! If one wants to freeze 1/2 for use beyond the 14 days, can the dough be successfully frozen? So, are you saying this method can be used with enriched doughs as well? If so, I would like to know more, please! Thanks. Gina, if you purchase the book or take it out of the library, you’ll see that it has the process for all types of doughs, including enriched doughs. these look so yummy :) I wonder if they would work as bread bowls for chowder or chili…? I didn’t read over all the comments, but for the most part it sounds pretty simple, even for me (can’t bake to save my life). Thanks for such a simple, and apparently delicious bread recipe :) can’t wait to give it a try!! Erica, I see no reason why not to use these as bread bowls, and actually, now that you you mention the notion, I have a mad crazy craving for a batch of New England Clam Chowder ladled in one of these boules! And yes, you’re correct, this recipe is insanely simple and not at all time-consuming. I really hope you like it, because most people I know who think they can’t bake simply haven’t had good recipes, and I suspect that’s what’s happened with you. So definitely give it a try and please let us know how it goes! Made this substituting about 1/4 of the wheat flour with rye flour and half a bottle of brown beer for some of the water, no problem. Incredible bread! Terrific to hear it, Jasper! Like the way you’re thinking. A lot. Really appreciate you taking the time to let us know. I really would like to try this but I don’t have a baking stone or dutch oven. Would a baking sheet work? or is there another substitute? Tami, you can use a baking sheet, my friend Christine does. Just make sure it’s wicked hot. I’d suggest sprinkling a piece of parchment with cornmeal and putting your shaped loaf on top. Then slide the paper and bread onto the baking sheet. It makes it easier. I tried this recipe last night. How do I get a beautiful round loaf? I tried the shaping but I wasn’t too successful and my loaf didn’t turn out as beautiful and golden. It was more like a panini. It tasted great though. Any tips? Hi, Fatima. Sorry you got wonky shaped loaves. Here’s video of Zöe and Jeff. If you cue it to 2:30, you’ll see the having process. My dough doesn’t quite hold its shape and it’s really kinda sticky! Any tips? Hi Eunice, it sounds like you have too much liquid or not enough flour. How did you measure your ingredients? Using the same measuring for flour and water, and the scoop and sweep method as per instructions. Nevertheless, the bread came out from the oven with a crusty top and moist inside. Maybe I should try it out again to get the right texture. What do think? Trial and error, right? I’m all in favor of trial and error- more chances to taste! BillieO2, when I say it’s easy, I mean it’s easy. Please give it a whirl and get back to me and let me know how it went. Haha, okay. I will definitely let you know! I am always happy to see this recipe reappear. It is one of my favorite recipes that you’ve posted. Oh…and just so you know…you have become part of my Sunday morning ritual. 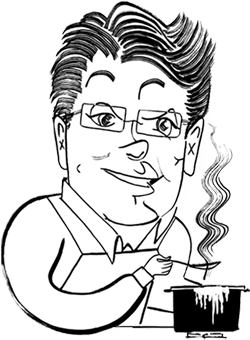 A steaming cup of my husband’s wonderful perked coffee and my weekly recipes from you. 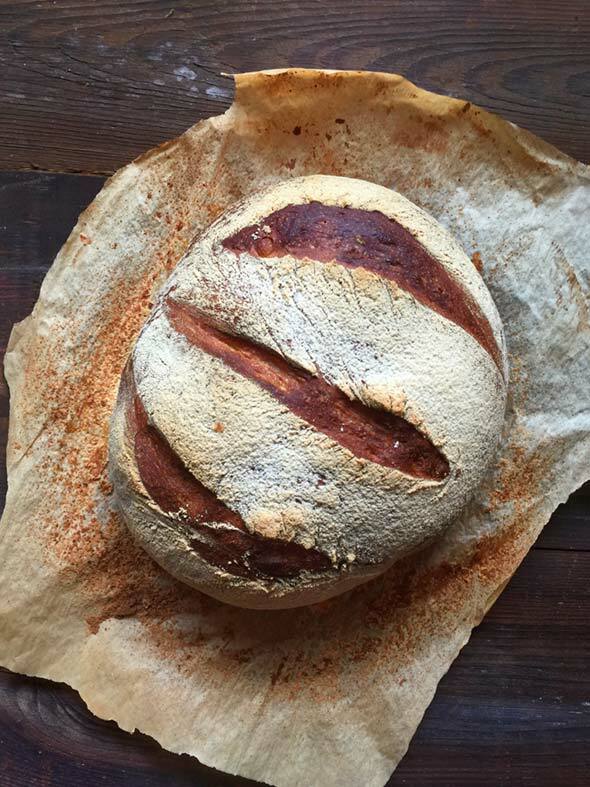 I have loved each and every recipe that I have tried from this site, but this bread probably tops the list. Thank you!!!! Happy New Year to you and yours. Karen, that is simply lovely to hear. We can ask for no greater compliment. So you’re welcome and thank you! Hi. Love making bread, usually use Richard Bertinet recipe but thought this looked good. I did exactly as per the recipe. I thought it looked very wet but after 2 hours it had risen right to the top of my Kitchen Aid bowl and was beginning to collapse on itself as you said it would. It had masses of air bubbles so I covered the bowl with a shower cap and put it in the fridge overnight. This morning it had reduced in volume but was still working, however it was just liquid, like a thick double cream! I had to pour it out and no way would I have been able to form it into a loaf. Where have I gone wrong? I found the combination of american cup sizes and pounds and grms a bit confusing. I had to pour it away. Help! Hi Frances, so sorry that you found the measurements confusing. Do you remember how much flour, water and salt you ultimately used? Changes in these proportions can result in a slack dough. There’s a lot going on in an active dough. The proteins unravel and align themselves minimizing the need for kneading. Flavors develop. Yeast and bacteria multiply. Sometimes, however, the strains of yeast and bacteria that get the upper hand are ones that can cause undesirable results, producing enzymes and/or acids that can destroy the gluten network and the starches too. Is the reader’s water softened or did she use distilled? Lack of minerals can prevent strong gluten development. The second most likely culprit would be the flour. Even if it is the same brand as the reader always uses flour can easily become contaminated. Not in the unsafe sense but in the sense of the soil having different strains of bacteria that then become a part of the growing wheat. Also, if the flour contains malt or other dough conditioners a slight change in the amount can cause slack doughs. Certain bacteria, which could just be in the air or on a surface the reader used, can also infect a dough and cause trouble. Was there any off color or flavor? So I tried this all last week after buying two of the 6 qt buckets to store the dough in. The bread came out looking beautiful, the taste? Sucked. Maybe it was the flour? Although Gold Medal has never been a problem for me before. Maybe it was the yeast? Fleischmanns, same as I have always used, I even used a kitchen scale to weigh my ingredients. I used steam in the bake, too and got a great crust. The texture was a bit gummy and the flavor just wasn’t there. Even with weighing the ingredients the dough was so sticky it was impossible to shape so I just plopped it onto a baking sheet with parchment paper. I think I need (knead) to stick with my old fashioned recipes and not waste my time with this. Better to knead a bit and take some time with the rise then to throw out the end results. Thank you for trying the recipe. I’m sorry your experience so far has been frustrating, but I think there are a couple of things that may help you get a result that you’ll like. 1. Shaping wet dough can be challenging, especially for bakers who have a lot of experience with a more traditional dough. It’s a new way of handling the dough. Here is a video my co-author made to show some tips on shaping wet dough. 2. The flavor of the dough on the first day of mixing can be a bit dull, especially if you are used to a longer rest (ferment) or if you typically use a starter in your dough. An easy way to develop more flavor is to just wait until the second day to start baking. This gives the dough a more complex character. If you find the dough is too yeasty, then you can always decrease the yeast in the recipe, but this will mean a longer rise time. Here is some more information about reducing the yeast. I hope this helps you get a loaf you are more excited about. If this doesn’t exactly address the issue, please give me more detail and I’ll try to help you get there. After years of being afraid of baking, I’m in culinary school now and taking a baking class. Made up a batch of this dough yesterday and baked my first loaf today. It was fantastic! We lived in Turkey many years ago and the freshly-baked loaf smelled and looked a lot like Turkish ekmek bread. This loaf had the same crackly crust but not as chewy an interior. It tasted wonderful alone, with butter, and as the foundation of a chicken salad sandwich. I don’t think it will make it anywhere near 14 days in the fridge! Terrific, Ian! I always want to fist pump when I hear about someone overcoming the fear of anything—especially anything in the kitchen. Lovely to hear that you care for this recipe as much as we do, and appreciate you teaching us about ekmek—will be on the lookout for it! First time bread maker. I used the pre-measured yeast packets (1/4 oz). One is not quite a tbsp and 2 is too much. I got a very yeasty tasting bread using 2 packets. Could I get away with using 1 packet of yeast or should I tear open the second packet to get the tbsp? The bread came out fabulous except for the really yeasty taste. Thanks for any comments / suggestions. Also, after several days of being in the refrigerator, there were some dark spots in the dough/bread. Not sure what that is. Could it be the start of mold? Kay, I would definitely use the required amount of yeast. That way you have a baseline. As far as the spots, I’ll defer to Zöe (I’ll ping her), one of the authors of the book. My guess is it might be related to the excess yeast. I’m thrilled that you tried the bread and enjoyed it. I’d start by reducing the amount of yeast to 1 tablespoon of yeast, especially if you’re are sensitive to the flavor. Is it a sweet yeasty taste or more of an alcohol flavor? The fermentation, especially if you’ve used extra yeast, can cause more of an alcohol smell and flavor to the dough. You can reduce this by using less yeast and by making sure the bucket is vented so the gas from the yeast can escape as the dough is rising. If the lid is on too tightly the gas gets trapped and can impart that yeasty or alcohol flavor. This is also the cause of the dark spots on the dough. As long as the dark spots are not black and do not have the classic mold look to them, the dough should be fine. It is highly unlikely, in fact I’ve never heard of it happening, that you will get mold after only several days. Many, many kind thanks. Zoë! Thank you for your kind reply. It was more of an alcohol type taste. I will try using only 1 tbsp of yeast next go round. Will also look for a better container. I used a large bowl with a plastic lid that just sat on top of the bowl unsealed. I think on day 3 I tried to seal the lid but it kept popping off so I just let it sit on top of the bowl. Thanks again for your reply. If not for my faux pas I would have probably had some pretty great bread. Take care! I have to say, I was pretty skeptical about this recipe. I mixed everything up around noon today, and watched it doubtfully. Around 2, it had clearly increased in size, and I stuck it in the fridge with some measure of hope that this might not be a wasted effort. I just couldn’t wait a full day, so I pulled a hunk off in the evening, turned the oven on, and set up the loaf to rise … and it didn’t rise very much at all. A failed attempt, I figured. Oh well, I stuck it in the oven anyway in hopes that it would rise more. After 20 minutes, it was a fairly small loaf of … delicious. Truly delicious. I’m mystified and thrilled by this recipe. I can’t wait to see how the loaves turn out later this week. Terrific, Preston! Thanks for keeping the faith…and for keeping us in the know regarding how your other loaves turn out. Really glad you’ve had the same delicious results we have with this recipe. Well, I followed the recipe to the letter. My dough is busy rising as I write. Thing is, I’m in London, UK. I wondering, will this recipe still work using English cup measures? Are they the same? Also, I read that English plain flour is the same as American all-purpose flour. But I’m not sure. Should I perhaps try using English strong bread making flour? Hope someone can help. Hmmm. Guess I’ll just have to wait and see. Second try got this right. Could have done with a minute or two more on the bake. It is blooming awesome. The dough has been sitting in the fridge since Sunday. Drawing some awesome flavour. 450 gram/1 lb in a small loaf pan. Drakensberg grown, stone ground flour. Another loaf pan with boiling water (1/2 cup) next to it in the convection oven! ?? Thanks Zoë. Did this in a southern town called Johannesburg in South Africa! P.S. Did my own metric conversion. Works just great! In using this recipe for the first time I was delighted with the minimal fuss and how quickly the dough comes together. Who wouldn’t love a batch that hangs out in the fridge doing its thing while producing fresh loaves through the week? Zoë and Jeff’s descriptive of the final 40 minutes on the counter after shaping was on point, “You may not see much rise during this period, but don’t fret. It will rise much more during baking.” My boule was looking rather lazy―it seemed to spread a tad more than rise in the final proof. But look at the oven spring it achieved while baking! And the flavor? Impeccable. Many thanks to the authors and to LC for sharing this gem of a recipe. Gorgeous, Brooks! And yes, we couldn’t agree more, Zoë and Jeff certainly know their bread! I use the same method for my pizza crusts. I leave the dough for at least 24 hours before shaping and baking them on a cornmeal dusted stone. The flour I use is from Italy. I eschwed making resolutions this New Year. I broke down and put this bread on my list. This looks so wonderful. Is it possible to cut this recipe in half? I don’t have freezer room to store 1/2 of the dough, and I don’t want to tempt myself to go through that much bread in just two weeks. Not saying that I couldnt, but…Thanks! Susan, yes, you absolutely can cut the recipe in half. But to assure success, I’d use a scale. Even an awesome crumb! Can’t quite seem to get the amazing crust most of you manage. However I believe I am getting a bit better at this. Jacques, wonderful! So glad you like the recipe. About the crust: Is your oven properly calibrated? If it’s not cranking that proper high heat, it’s hard to get the right crust. Also, maybe move the rack a bit higher. And you’re using the water, right? That’s crucial, too. Definitely using water David. I am using a convection oven and will try one notch higher on the next batch (ie 230 centigrade). Cannot move the rack!? Hmmm, Jacques. With convection, it should definitely be browner and crisper. Have you checked your oven with an oven thermometer? This recipe is amazing. And it’s so good coz you can have it over and over again in the next days. Thank you so much.? Roda, it is a winner! And you are most welcome. Hello! Just two questions: 1.) Can the bread be cooked in an iron skillet, and 2.) what temp. should the Crock Pot be set to? You sure can bake in an iron skillet. We suggest preheating the skillet to improve the oven spring (rise). You’ll want to lower the bread into the skillet on a piece of parchment or use a pizza peel. Getting the bread out of the skillet is a bit trickier than a stone, because it has sides you can’t just scoop it onto a peel. You’ll want to use a spatula to help lift it out. Hi Zoe ! And hello Renee . . . Thanks again for the info. I will let you know how the my bread comes out. I have not made the bread before, I will try to educate myself using all the great instructions supplied by you and your websites. I will try each of the methods and probably stick to the one that works best. I expect I will gain some weight while enjoying the bread. Hi there, I was wondering if it works well by using fresh yeast as opposed to using the dry granules? And if so, what would be the accurate conversion? Thanks, cannot wait to try this!! Another believer here! This was my first successful bread recipe after past failures and came out great on the first try. Thanks so much for posting. I halved the recipe and used my Kitchenaid with dough hook on speed 2 or 3 until it formed a ball. I added some herbs de provence but wish I had been a lot more generous with the salt – I didn’t measure just sprinkled a bit like I was seasoning a plate of food. I baked in a in a Le Creuset dutch oven sprayed with cooking spray (didn’t have any parchment and thankfully googled whether wax paper could go in the oven before attempting!) and followed the directions to preheat for 20 minutes. Definitely a keeper, will be trying next week with whole wheat flour. WW version went well, I halved the recipe again and did have AP/WW flour with fresh garlic and herbs. I didn’t have enough yeast so was short on that but it turned out fine, a little firmer than the all white version and ofcourse I didn’t get the same level of rise. I will definitely try WW again with the right amount of yeast. This recipe is so forgiving! If you have a pizza crust like it please post. And thanks again for sharing! Terrific to hear, Lauren! And yes, we agree, it’s quite forgiving. 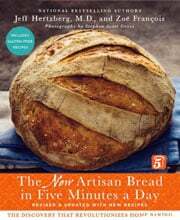 As for a pizza crust, I know that the authors of this recipe address that in the book from which this recipe was excerpted, http://www.amazon.com/Artisan-Bread-Five-Minutes-Revolutionizes/dp/0312362919. I can assure you the book is a sound investment of your money, time, and expectations! Did u use the lid? And did you add water to a roasting pan to steam the bread?? Many thanks for these insights, Rachael. Well I am going to keep trying but I can’t say I enjoyed as much success as those that posted before me. The dough appeared to double in size so I followed the instructions and placed it in the fridge for 24 hours. Upon pulling it out of the fridge it appears to have continued to rise more in those 24 hours. When I pulled the bread out of the oven ( 25 minutes to achieve the crust color I saw in the pictures) I had 3 loaves of bread that smelled wonderful but were dense and contained little to none of the beautiful air holes that I saw in many of the pictures. Not certain what I am doing wrong and would love some additional guidance. It is not entirely unusual for the dough to continue to rise in the refrigerator after the initial 2 hours on the counter. Did you bake the entire batch of dough at once? It sounds like you broke it into 3 loaves, is that right? If so, those loaves will have been larger than what we are giving resting and baking times for and a dense loaf would be expected. If you are baking larger loaves, you will need to let the dough rest longer, by about 30 to 40 minutes. If your loaves are large and you experienced a dense interior, I would recommend baking for at least 30, if not 35 minutes. Be sure not to cut into the loaves until they are completely cooled. I stumbled upon your website and think it’s fab! I have been an avid baker or no knead bread for a few years now. It turns out great. I am now trying to bake in a bell shaped cloche rather than a dutch oven, however even though I do the final rise in a banneton,the dough is still spreading giving me a super delicious but fat loaf rather like a ciabatta. Do you think that lining the banneton with oven paper and putting the whole thing, paper and all, in the pre heated cloche will help my loaf to become a boule please? Thanks. Tanya, does this post from Zöe and Jeff help? I am not a “real” cook or baker. I am just doing whole foods cooked at home from scratch. We are an older couple, so my huge challenge is to cook good small meals for two. Bread has been a serious challenge–we just usually don’t need whole loaves at a time, and we can only use so many croutons and puddings from the leftovers. And keeping bags of ciabatta rolls and partial loaves of bread is too much for my small freezer (and not as satisfying as fresh from the oven.) I made a batch of this recipe to try it out making just two sandwich sized rolls at a time. Beautiful! Nice and crusty and chewy…and easy. This may not replace every single kind of bread we like, but it is a wonderful way to have fresh baked bread on an hour or so notice. I have now invested in a bowl just for this dough in the fridge! Thank you! You are so very welcome, Mary Beth! I am so pleased to hear that this recipe is working out so beautifully for your small-batch needs. Thank you so much for letting us know! I need to add something about this wonderful recipe—it works in the slow-cooker!!! With my AC working like mad to keep up with 100+ heat indices, I have not wanted to turn on my oven any more than absolutely necessary….but I still want fresh bread. So I let my slow-cooker heat up on high while my dough came to room temp. Brushed a bit of ghee (ghee because already I had it out for something else) and sprinkled with “everything” seasoning. I just plopped it into the slow-cooker and hoped for the best. Brilliant, Mary Beth! Truly clever thinking. Do you happen to recall how long you baked the loaf? I’m certain others will want to try this, too. Including my husband. We live in the urban desert and try not to turn on the oven at all during summer, same as you, but we may just have to break down and buy a slow cooker…thank you so much for sharing your trick with us! For you high-altitude bakers: make sure to add an extra 3/4 cup of water to the recipe, and bake your bread for a minimum of 30 minutes. (learned this the trial and error way!) BEST BREAD EVER!!!!!!!!!!!!!!!!!!!! Thanks so much for the tip, Sheila! And so very glad that you like the bread. Antonia, 1 exact cup of water equal 8 ounces in weight. That appears to contradict the standard conversion of water from volume to mass, 1 cup = 236 grams. See all of the links on this search result page. (though, oddly, 1 says that a cup of water = 250 grams.) 236 grams divided by 28.35 (grams per ounce) = 8.34 ounces. What am I missing? Antonia, I think you answered your own question! There are inconsistencies to these algorithms. When I weighed 1 cup of water in my kitchen, I got three amounts: 7.9 ounces, 8.1 ounce, and 8.18 ounces. Serious Eats has 1 cup of water coming in at 237 ml/8.01 fluid ounces. (For this recipe, it would be 24.03 ounces.) I can assure you that whatever the precise amount of your water is, it will be perfect. This is a wet dough and thrives on the moisture. Does this help? Thank you for this response. I understand that the exact amount of moisture may not affect this bread in a noticeable way. But for the record, 24.03 fluid ounces (a volume measure as correctly noted in the SeriousEats piece you link) = 24.9 ounces (mass), or nearly a full ounce of difference. That might not matter for this recipe, but it kind of bothers me that people reading the ingredient list would come away thinking that a cup of water = 8 ounces exactly. It might not matter here, but you would agree, wouldn’t you, that the difference might matter in another, less forgiving recipe? Absolutely despair of this bread! I’ve followed the recipe to the T (both weights and scoop and sweep methods) tried different flours, same flour different measures, etc etc. The flavor is great but my loaves have never (except once) looked like the pics. They all spread too much and look like overinflated pita breads. The one time I did have a good-looking loaf I had added loads more flour but then the texture and flavor were wrong. I must be missing something! Sue, I’m at a loss as I’ve never had that happen. Let me loop in Zöe, one of the authors. I’m sorry it’s been frustrating, but I think we can help you bake a wonderful loaf. What you have described can often be a matter of shaping the dough. If you don’t get a tight enough ball, it can spread and not rise as well. Here is a video to watch on shaping wet dough, which is a bit different than more traditional recipes. Are you baking on a stone? If so, how long are you preheating it? Sounds like perhaps you are not getting the initial oven spring that you want and this can often be from a too cool stone. Thick stones can take up to 60 minutes to really be hot through and through. Lastly, is your oven gas or electric? Oh, one more question, do you live at high altitude? I’ve been baking a no-knead bread that is identical to this one as far as ingredients and am happy with the results. I love that yours waits in the fridge for me though! I’m wondering if I can use my present baking technique which is preheating a cast-iron pot in the oven and dropping the rested loaf on parchment into the pan, putting the lid on and baking for half an hour after which I remove the lid for 15 minutes to form the crust. Is this doable, or should I just follow your technique to ensure your awesome result? larry, I’d do this: Follow the recipe as is once and see if you like the results. Then try the cast-iron method. My guess is you’ll lose some volume when you flip the dough into the pot. Ok David, will do. And thanks for taking the time to reply! I can’t wait to get this going! Mixed up a half batch on Sunday and finally got around to baking it yesterday night. Made several mistakes: a tad too much water and forgot to slash the top. Center of the bread ended up just slightly gummy but the sides are awesome! Great crumb! Will bake the rest of the dough soon. Rambles, with a quick slash and a longer baking time, it should be perfect. Oh, sweet honey in the rock! This bread recipe KILLS it! I just discovered your master recipe 2 weeks ago and have been making it every.single.day since! I have been baking bread for years and never quite achieved this level of taste and texture. Thank you SO MUCH for making this free for all to share! I (and my family and friends) am in heaven! Susie, I’m so happy you like this! I really is great. You’re more than welcome. This is a super long comment, but I feel excited and I just want to share my experience. I have to be honest, I’m kind of a visual-learner, so twice I tried to bake artisan bread, using 2 different recipes but based on the same source, twice I failed. My main issue (it’s not you, it’s me – this time I mean it) is that because I use metric measurements and I don’t have measuring cups, only a scale so I was doomed from the start. Also, because I don’t have a model before me, I couldn’t make out the liquid and flour ratio, how the right consistency looks like, how wet is not-wet-enough, how wet is just right? I know I got the “too-wet” right on the nose because both my attempts came out looking like flatbreads, waited 2-times overnight proofing for 3 focaccia-looking things and 1 sad loaf (if you put the dough in a loaf pan, it will come out quite decent, mine needed a bit more time in the oven than the round ones though – cannot bring myself to call them boule, they were just disks! *crying invisible tears*). But in the end it’s all great, please don’t think I’m mad, I typed the whole thing above with a smile on my face. Because 1st attempt I put chopped fresh rosemary and roasted garlic in the dough, though gravely disappointed with the shape, the smell swept me off my feet and I just had to slather on an unhealthy amount of butter on the first slide. After 1 bite I was knocked out cold, it was so divine that I just couldn’t stop eating! The crust was crispy and the inside was soft and chewy (I used wholewheat strong flour). 2nd attempt, I used this recipe, still put rosemary and roasted garlic in, this time with fresh thyme as well. I thought this flavour-combo would suit savory food only, but then I told myself “to hell with it” and tried it with marmalade and Nutella. My sweet tooth was satisfied, thoroughly satisfied! I think I’m gonna go broke for just buying flour and yeast alone, I’m so addicted to baking bread now! TL;RD: Thank you so much for this recipe, thank you for all the work you’ve put in. You’re all wonderful beautiful people and I love you! Jo LD, while I’m thrilled you’re happy, I’m dismayed that you didn’t get the results we promised: a nice, round boule! What can we do to help you get there? Would metric measurements help? Thank you for replying and oh yes, metric measurements would be a lifesaver. There are so many conversion websites on cups-to-metric but they are so inconsistent and vague (I can’t measure 275.98753 grams and 445.5879743 milliliters!). And if I could have a description of what the dough’s consistency is like after mixing, I would be so grateful (and if I can have a picture, then you’re a saint, because you’re a godsend already :D). May I ask for one more thing, my personal taste leans more on breads with chewy inside and a great crunchy crust, preferably wholegrain/wholewheat, so could I trouble you for more bread recipes that fit the description? (English is not my mother tongue so I hope you get my gibberish.) Thank you for your help and best wishes to you and your loved ones! Jo, I just input the metric equivalents for the recipe so that you can make it. The dough is going to be pretty standard after mixing as far as American-style bread doughs go and not nearly so wet as most Italian doughs. (I hope that helps. I’m not certain what types of bread dough you typically make.) As for more whole grain bread, we have a truly lovely rye bread publishing on the site in the next couple weeks so kindly keep that in mind. We are constantly testing whole grain bread recipes in our kitchens but most of the time they don’t make it to the site because they end up overly dense. But we continue to search and will let you know when we find one that we feel is stellar enough to share! Update on the artisan bread journey: I finally got around the liquid measuring (3 cups = 700ml roughly) and because I used instant yeast, I didn’t mix the yeast with water or anything. I just mixed the dry ingredients together with my stand mixer and gradually added water like with most bread (I don’t know if it’s going to change the bread’s quality). Was a tad confused with how wet is too wet (again) but thanks to that video on this recipe that I saw somewhere in this comment section, I managed to get an idea on how the dough’s consistency would be (visual learner struggles). Covered with a tea towel for both proofs, and when I got it out of the fridge to bake it, I almost choked up because I could finally hold the damn dough! I don’t have a baking stone so I just put a baking sheet in the oven while it was heating up (made pizza that way, perfect every time) and after that 40 minutes rest I put the dough (shaped into 2 boules) on parchment paper and put the whole thing on that heated baking sheet (and burned on myself on the wrist, but I got a bunch of oven-burn scars on my hands already, I like to call them my “battle scars”). After 26 minutes, I checked on the breads and oh my goodness, they were beautiful. I had to turned them around for an even colorization because my oven gets hotter at the back, and when they were not as dark as I expected, but I didn’t want to push my luck and dry them out just to get a darker crust. One more thing, I slid the dough with the parchment paper into the oven when I baked it, so the loaves’ bottoms were soft and not crusty. (May I suggest you add in a note that if people can’t slide the dough off the parchment paper onto the heated baking stone/sheet, just use kitchen foil instead and not worrying about sliding anything off of anything. Twice I made homemade pizza like that and it came out perfect everything, so I can attest to this.) And they SANG! They really did! I laughed like a maniac who had just made her first successful loaves of artisan bread. I wouldn’t know how they’d look on the inside, because I made them as gift for a friend, so their outside beauty is all I can give you. Thank you for your help and this recipe. Best of luck and lots of love from the UK! Much thanks to you for your patience and perseverence with learning how to work with a new dough, Jo LD! Thank you, too, for taking the time to let us know. Am so relieved that it worked out so well. And I know exactly that giddy ebullience that comes from a recipe working out well. (I am prone not just to laughter and tears but the occasional dancing about the kitchen.) Would love the picture. If you have problems uploading the photo, just email it to me at renee@leitesculinaria.com and I’ll take care of it. Also, one last thing, my arms, too, are scarred from oven burns. My husband calls me reckless but I prefer to think of it as intensely fixated on the recipe. Again, I’m so pleased for you! You made my day. Has anyone ever tried making raisin bread using this dough recipe? i’m a complete novice bread maker but would be as simple as adding cinnamon and raisins to the dough when making it and baking as normal? Dave, that’s about the sum of it. This post by Zöe and Jeff might help. Awesome – I’ll give it a shot. Love how versatile this bread recipe is! Dave, it is, indeed, incredibly versatile! I wanted to share some advice with you on adding raisins (or nuts or olives) to bread dough from our resident professional bread baker. I’ve tweaked it slightly as it was in response to a reader query about adding olives to ciabatta, although it applies to raisins and any bread dough as well. There are two methods she recommends. Here’s what she has to say: “The first method gives a stronger raisin-y taste all through the bread by incorporating the raisins at the beginning of the kneading. This is what most beginners do with any addition such as olives, nuts, cheese. Yes, this means a more uniform distribution and the taste of the addition throughout the loaf, but I almost never do it this way because it requires adjustments to hydration (more for dry ingredients, less for wet ones) and, more important, it can interfere with gluten development. The second method, my preferred technique, is to add the raisins (or olives, nuts, cheese) after the dough has fully developed—that is to say, after it has been kneaded completely. Just knead the raisins in by hand before the first rise. With this method, you should not need to adjust the water. A problem that arises with additions (using either method above) is that they pop through the dough and whatever bits are exposed to the heat get dried out and hard. Not pleasant when it happens. With a regular country loaf, there’s two ways to minimize that. You can simply push the pieces that peek out after shaping the dough back into the dough before setting it to proof. That helps quite a bit. A fussier, but totally effective, approach is to cut off a piece of plain dough before the addition. I eyeball it at about 1/4 of the dough. Add the raisins to the larger pieces and shape the loaf. Then roll out the reserved piece to a thin sheet and drape it around the shaped dough, sealing on the bottom. This keeps all the bits inside, entirely preventing pop-throughs.” Kindly let us know how it goes! 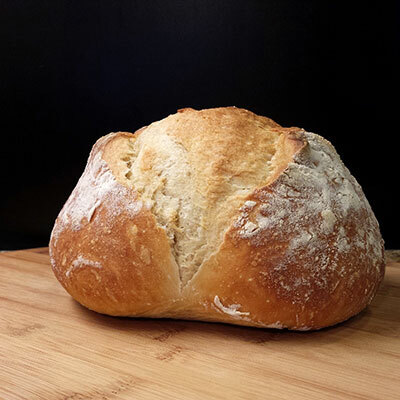 I absolutely adore this bread and have made a dozen or more loaves with great success. I have only tried the whole wheat recipe once (with hard red winter wheat) and while it was a bit denser than the AP version, it was still quite good. My question is about the addition of other ingredients. Do you mean above that you mix the dough as you would normally and then add in cheese/olives/nuts/herbs and then do the 40-90m rise? How much volume of additions would be acceptable to add? And would you grate or cube cheese? Would garlic or onion be better added as powdered or fresh chopped/minced? I’m just looking for some ideas to kick off my experimentation! Thank you to Jeff and Zoe for this unbelievable bread!! Lovely to hear that you adore this bread, Maddie! Thanks so much for taking the time to let us know. As for the addition of other ingredients, yes, in the method described in my comment above, I say to add those sorts of ingredients as you’re kneading the dough before the first rise. I think the amount is going to be dependent on personal preference and will depend on the specific ingredient but figure about a handful. As for the cheese, it depends if you want a more wispy hint of cheese that almost melts into the dough (grate) or blobs of cheese throughout (cube). If adding garlic, I would add roasted garlic that you’ve mashed into a paste or minced garlic that you’ve sauteed but beware garlic can be so pungent! Hi! I just popped my first try loaves in the oven, I’m so happy with how easy this was to make. Everything was going great and my loaves were poofed up but I really had trouble with the scoring. 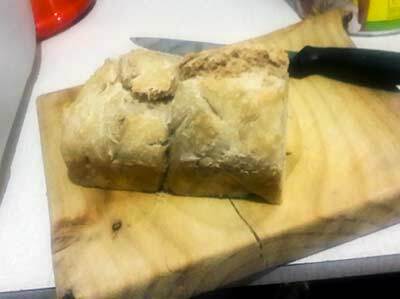 I used a new serrated knife and tried to slash quickly, but it snagged and deformed the loaf. Tried working slower on the second loaf, but that didn’t work great either. They’re not ruined and still looked pretty good, but the were bent out of shape. Any advice on how to do better next time? Thanks!! Sarah, I, too, have trouble sometimes. What I do is lightly coat the knife with olive oil. That seems to help. That did make a difference, thanks David! I’ll get better with practice too! I tried to mix in some caramelized onions while I was shaping the loaves; it was difficult to do. They came out well, but the onions could have been better distributed. Would the dough still work if I mix them in from the very beginning? Sarah, yes, I think so. When I add cheese, bacon, and black pepper, I add them to the flour and toss. Then I proceed with the recipe. Makes it easier. “It’s dough, not a newborn” has to be the best line ever written in a recipe. Hi, I made this bread three times. The first time it came out perfect. The last two times, the dough seemed to be a bit mushy even though it was thoroughly cooked. I’m using the same cooking methods and techniques that I used the first time but something must be off. Any idea what would cause this? It’s just too soft. I use a cooking thermometer and the temperature is over 220°. Jenny, thanks so much for letting us know about your experience. I’ve asked Zoe Francois, who created this recipe, for her advice and either she or I will be back with you shortly! My apologies for the delay in responding. How old was the dough when you baked it the last two times? If the dough had sat for a number of days without being used, it may have lost some of it’s rising power, which can result in being a bit denser. Did it seem different in consistency when you pulled it out of the container? Any more details you could give me would help me advise you better. I must’ve missed the notification that you replied. Anyhow, no the dough was fresh. I’ve made it a few more times and experimented with letting the dough fully cool. Although it was much less mushy it wasn’t that perfect artisan bread texture yet. I don’t have a Dutch oven so I’m wondering if it has to do with that. I was using a Pyrex dish with a lid… When I bake my batch today I plan on trying a stainless steel pot with aluminum foil covering it. I still can’t figure out what changed since the first time I baked this bread. Jenny, I think the problem is this recipes doesn’t call for a Dutch oven or any kind of pot. That’s a different artisan bread recipe. I know that some readers have baked the bread that way, but that’s not how the recipe is written. I’ve made this bread a lot, and have never used a pot. I did try it without the Dutch oven and baked it in a Wolfgang Puck pressure cooker oven, sealed and without a tray of water because there was no room for it. It came out great, close to perfect, I would say. But the bread consistency is kind of heavy the next day. Is there a problem with slicing it when it’s still warm right out if the oven? Will that affect texture? Jenny, I can’t really say what’s causing the heaviness. This recipe isn’t written for a pressure cooker oven or a Dutch oven. Have you made it is regular oven? And yes, it’s always best to let the loaf cool completely before slicing. Turned out gorgeous! Easy. Love the slightly sourdough taste. Could this be made into a rye loaf? I love sourdough rye. Maggie, it certainly can. We don’t have the recipe on the site, but it’s in the book and might be on their site. So I tried this for my very first attempt at making bread ever. I don’t have a stone and really didn’t know what to expect for a finished product. I built the dough using the measured weight of the flour and water rather than the volume. I mixed the ingredients in a bowl according to the recipe and let it rest at room temperature for a little more than 2 hours then put it in the fridge. I removed the dough from the fridge an hour before baking and tried to take about half it out to make a boule. Much to my dismay everything deflated as soon as I started to slice off the part I wanted. I was left with this sticky mass in my hand and a totally deflated mass in the container (and I am saving this for a second attempt). I managed to roughly form a boule and placed it on a perforated pizza pan that had been coated with cornmeal. Since I don’t have a stone I thought using my pizza pan that I use when making pizza would work. I left the dough sit for the 40 minutes (very disappointed that it didn’t rise) liberally dusted the top with flower and then used a sharp blade to score it. I popped it in the oven at 450 (along with some water in a pan as instructed). To my surprise after 15 to 20 minutes the boule had increased in height by 3 to 4 times! After 35 minutes the bread was a nice golden brown so I pulled it from the oven and let it cool. I was surprised that the loaf slid right off the pan. The result was a dense bread with lots of little holes, a crispy crust with a nice chew. It was a great first attempt and I think it was edible. My wife loved it thinks I’m a genius. Next time around I need to figure out how to make the inside cook a little more as the bread was a little gummy at the center bottom of the loaf. I think if I cut the dough a little deeper next time (I was afraid to cut a half inch deep since the dough was only about 1 inch high) it may help get the moisture out of the bread. Also I read where I could turn off the oven and crack the oven door a couple of inches I could leave the loaf inside to cool and that may help. Anyway I think this is a fool proof recipe for some great classic bread. Thanks. Terry, you bet. Have you tested your oven temperature with a thermometer? It might be running hot, which would bake the crust but leave the inside a bit gummy. I also have an instant read thermometer that I stick into the loaves. I pull them out when it’s between 200 and 210 degrees F.
Thanks for the tip David. I bought an oven thermometer on the weekend to test the oven temp. When my oven says 450 the thermometer says 430. When I put the loaf into the oven and add the water to the pan the temperature drops to 400 and stays there so I baked the loaf for 35 minutes. This time I scored the loaf deeper maybe a half inch deep. The loaf rose nicely. The outside is nice and brown and crispy, There is plenty of nice air pockets inside the loaf but it is still gummy. I don’t have a instant read thermometer so maybe I will get one of those next. I don’t think I could have left the loaf in the oven much longer as it was starting to smell over cooked. Sorry but I can’t seem to attach pictures here to show you what it looks like. Terry, as long as there was progress, I’m happy. And I think an instant-read thermometer would be a good idea. The way you don’t have to rely upon just your nose! You can send a picture to me at david @ leitesculinaria . com. I’ll happily add it to your comment. Used this recipe, but halved it and also added a pinch of sugar to the dough mix. Preheated oven with my baking stone in it. Removed dough from the bowl at approximately 2 hours. To my work surface, which had been dusted with a little flour. Did NOT punch it down. Gently dusted the top with some flour as well and formed it into a large long wide oval. Not as thin as a regular baguette. Ran a blade lengthwise along the top and baked for about 25 minuues and transferred to a cooking rack. Brushed the top with a little butter and let cool. Nice crust but not too hard. And lovely crumb (not too dense). I did not do any refrigeration at all. 2 hours on the counter and straight into the oven. You’re so very welcome, Usswl! Hi, I recently started baking artisan bread. I have a question. This recipe states all purpose flour. I live in South Africa. We have cake flour and bread flour. Do I use bread flour? The same quantity – 910g? If I want to use whole wheat or brown bread flour, will the liquid amount of 680g still be the same? Thank you and look forward to your feedback. Henriette, yes, you can use the same amount of bread flour. I’ve never made it with whole wheat or brown bread flours, so I can’t confidently say the amount of liquid won’t change. Alright…I just made it. Added some Italian seasoning and garlic and a little ground flaxseed for the husband’s health. It’s really great. Tastes wonderful. Has a BEAUTIFUL firm, crisp yet chewy crust. So fantastic. Any suggestions for a lighter inside? Maisie, congests on baking bread! Regarding your question, let the dough sit in the fridge the required amount of time and give it some extra time on the counter. That should give it a bit more lift. I’d like to try this recipe, but am not sure how to break off a pound of dough – about how many pounds does the recipe make? Stephanie, that would be about 1/4 of the dough. The recipe make 4 1-pound loaves. Is it possible for it to rise for too long? I got involved with something with my son and left it out to rise for 3 hours, in a humid, tropical climate. Tamara, I think it might have lost some volume. Did you bake it? If so, how did it come out? It seemed to spread a bit and I didn’t get a super high boule like some of the photos, but it wasn’t super dense. I made it with fresh rosemary, and the unbelievable aroma coming out of the oven more than made up for any lack of rise. Slathered with French butter and my 8 year old nearly ate the whole loaf. The crust was perfect. Could have been a tad more done inside, next time will use a thermometer and not just thump it. Inspired to keep trying. Thanks! That’s great, Tamara. The rise has a lot to do with the shaping of the loaf. Take a look at this video from Zoë for tips. Of course, Tamara. Always here to help! Hello, I sell bread at the local farmers market and I would love to try this recipe! Just wondering, if I want to put 4 loaves in the oven at a time, would i need to change the amount of time for baking? Or would i need to change the amount of water poured in the broiler pan? Also, if I want to make 2lb loaves, how much longer will I need to bake the loaves? Rachel, what a great idea. Best of luck with that. You would need to change the baking time somewhat because you’re lowering the temperature of the oven more by baking four times the bread. I can’t give you a precise time because I’ve never done that. Look for a rich brown crust and a hollow sound when tappped on the bottom. Yes, I would pour in a bit more water: perhaps 1 1/2 cups. And for 2-pound loaves, 45 to 50 minutes should do it. My husband and I have been making bread using your recipe for a long time. It is amazing. We share our bread with our friends, family, and our kids. We are the cool teachers, neighbors, and friends. People prefer this bread than any other goodies we share. It is crusty, tasty, and so easy to make. Pure, fresh, and satisfying. The only problem we have is that it goes fast. Everybody loves it but we also love sharing it. I don’t know why but this is something that brings us close to old times, traditions, and nature. I am from Greece, the smell while the bread is baking brings me home every time. Thanks for sharing this recipe. We LOVE it! Fotini, now that’s what I love to hear! The next time you make a few loaves, send us some pictures. We’d love to share them with out readers. How does it do with other flours like Rye, Semolina, Buckwheat, even Cornmeal? Of course I know not to use these things as anything but additive, but how about things like Millet? This dough is basically fermenting in the reefer, right? Does the salt keep it from souring? Andi, I can’t answer your question fully. I have used rye in some of the recipes in their book, and it works fine. As to the others, I can’t say. There are too many variables when you consider each flour. I’d suggest purchasing their book–it has recipes for a multitude of flours. I have made dozens of loaves from this recipe and just about always have it in the refrigerator. It”s requested by my friends as a hostess gift and I’m sure has garnered me many dinner invitations! Hilltopgal, superb! I think it’s wonderful always to have something on hand as a gift for friends. When do I add olives or onion? I would like to try your recipe but I’m not sure. Thanks. Aurelia, I would add them when you’re mixing the dough. Can seeds and nuts be added to this as well? I want to make an everything bread. Absolutely, Tony! I’ve added seeds, meats, cheeses, bacon, and such to my breads. Here is bacon-cheese coronne I made recently. Hi, I have made this dough 5 times. I have tried different plain flours just to see what works best. For some reason my bread takes about an hour to cook. Any reason why? I still get 4 lovely loaves but they just take a bit longer. I do have a big oven and i cook the 4 loaves at once. Thank you for a great recipe! Antonella, the timing in the recipe is for one loaf. I find when I make multiples of anything (cookies, cake, loaves of bread, etc.) it takes longer because there’s more cold items going in the oven. The oven has to heat up four times as much food. Another small factor is it probably takes you longer to slip four loaves in rather than one, so the oven door is opened longer, causing more heat to escape. I’d try baking just one loaf and see if the timing is correct. If not, you’re oven might need a small calibration. Antonella, the best way to store the bread is to turn it cut-side down on a cutting board. That way the inside stays nice and soft while the outside retains its crunch. I started making this bread during Hurricane Harvey when, during a call from an old friend in NY to check on me, I was complaining there was no bread to be had anywhere. She said, “Do you have flour, water and yeast? Make your own, it’s easy!” Onto google, and “five minutes with no kneading” called out to me. I do low carb myself for health reasons, but this bread is so easy and so delicious, I have to cheat sometimes. Since my kids use it for toast, I bake it in a loaf pan, using half the risen dough. I have been experimenting with the rise and baking times, though. Know what else I love? Fresh baked bread like this in the store is $4 a loaf, and it has preservatives! Thank you, thank you, thank you! Happy to report that I’ve made batches of this dough every single week since Hurricane Harvey. 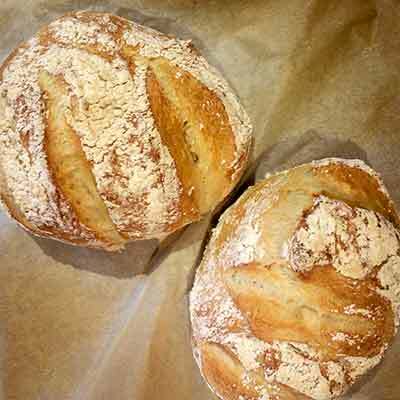 I usually make the smaller boules now, although my latest experiment is making little rolls. Shorter rising/baking time, and oven set at 425. These days if I don’t bring my principal and assistant superintendent some fresh bread every Monday morning in an old-fashioned paper lunch bag, they are sad—I’ve spoiled them so! I will be making these rolls for the school potluck this Wednesday. Aunt Paula, I’m delighted to see your comment here. And I love that others enjoyed the bread as much as you did. Perhaps you’ll become our Culinary Moses, leading a multitude to the Promise Land of Perfect Loaves! Help! The dough seems far too wet and loose. Do I just keep adding flour until it firms up?